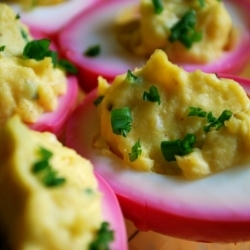 Spring time deviled eggs! Cute leftover hard boiled egg recipe! This recipe works best if you allow the eggs to pickle overnight, but we recommend 4 hours minimum pickling time. Mix the water, vinegar, sugar, salt and can of beets. Combine the peeled hard boiled eggs with the beet mixture. Store in the fridge for 4 minimum-48 hours in an air-tight container. Once the eggs are nice and pickled, strain them from the liquid and cut each egg in half lengthwise. Scoop the yolks out of the egg and transfer to a mixing bowl. Now, mash up those yolks with the mustard, horseradish and 2 tbsp. of the chopped green onion. Sprinkle in the salt, pepper and onion powder. Once you have a creamy texture, pipe or spoon into the eggs evenly. Garnish with the remaining green onion. Adjust the egg mixture to your liking! Add your favorite flavors or herbs!